J.M. Snyder » Preorder Dad’s Nerdy New Boyfriend today! 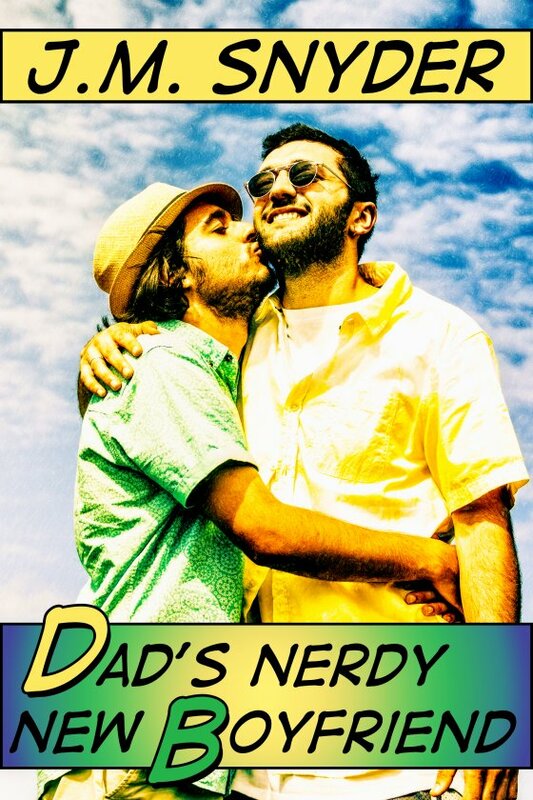 Preorder Dad’s Nerdy New Boyfriend today! Dad’s Nerdy New Boyfriend is coming next week, but like an idiot I published it on Amazon instead of setting it for preorder, so you can download it now if you want to! “It’s just one page, nothing fancy.” Easing his hands under Rick’s on the laptop keyboard, Marty opened the web browser. The home page came up, displaying the store name, Ricochet Comics, in black inside a yellow starburst outlined in red. It looked ripped from the pages of a garish comic book. Behind the logo, the webpage’s background was done in a multi-color halftone-dot pattern. The online store had a three-column layout, with the items displayed in the center column. Marty leaned closer as Rick went over the sections — categories, shopping cart, specials, new and featured products. Everything was customizable, and Rick could easily see how he could revamp the layout using Marty’s existing graphics as inspiration. “Oh, the backend is a cinch.” Rick opened a new tab and called up the store’s admin page. Quickly he reviewed the admin dashboard so Marty could see how to review orders or generate reports, even how to enter new items into the store. “Piece of cake,” Rick assured him. His weight on Rick’s arm was heavy and welcome. When Rick looked down at him, Marty turned his head, laying his cheek against Rick’s shirt sleeve. His eyes looked impossibly blue behind his round glasses, and the tiniest lines spidered out from the corners, making him look his age and not like Harry Potter at all. In fact, this close, Rick barely noticed the glasses except to wonder if Marty’s eyes would still be so blue — or so large — if he took them off. He didn’t realize he was staring until Marty’s eyebrows raised in question. “Well?” Marty asked. He was staring again, he knew it this time, but for some reason whenever he looked into Marty’s eyes, he seemed to lose his train of thought. Databases, the website, adding new products, he reminded himself. Jeez, man, look alive here. He’s going to think you’re an idiot if you keep zoning out. Rick didn’t want to say yes — he didn’t want to lose the sudden intimacy between them. But he couldn’t concentrate on what he was doing, either. Marty’s presence was so palpable beside him, so warm and real, so there. Being so close like they were made Rick realize just how long it had been since … well, since someone’s been so interested in me. Who was he kidding? Sure, Marty was obviously into him, but Rick would be lying if he said he wasn’t a little intrigued by the comic shop owner, too. His gaze drifted over Marty’s face. The man wasn’t exactly gorgeous but he was cute, and Rick suspected he was the type of guy who got more attractive the more they’d get to know each other. “By me?” Marty asked bluntly. Preorder the ebook from other retailers today!